« Should the governor of Virginia resign over racist yearbook photos? UPDATE: If religious practices promote well being, one would expect that more religious countries would have happier inhabitants. But the graph below (prepared by reader gluonspring) shows that this is not the case: the most religious countries score lowest on the UN’s “happiness index.” Of course this is a correlation and not necessarily a causal relationship, and there are other factors as well (people may turn to religion if they are poor and unhappy), but this certainly goes against DeSteno’s hypothesis. I’ve gotten the link to this new NYT op-ed from about a dozen readers, with some explicitly asking me to respond. Okay, I’ll bite, though my response will be limited to this site as there’s no way in hell that the New York Times would publish a piece saying that science and religion are not mutually helpful. The writer is David DeSteno, a professor of psychology at Northeastern University and author of the book Emotional Success: The Power of Gratitude, Compassion, and Pride. More about him and his funding sources (yes, you can guess!) later. The article manages to press all my buttons, including extolling the oleaginous Krista Tippett (I had to listen to her ask Daniel Kahneman this morning how he manages to “inhabit the space of his theories”!) and criticizing Steven Pinker. But let’s examine the arguments, which are independent of whether DeSteno loves Krista Tippett (she is, by the way, funded by Templeton). 1.) Meditation. The idea that meditation can reduce suffering and make people more moral has, says DeSteno, been supported by science. He also says that idea comes from Buddhism. 2.) Ritual. DeSteno says that science has found that the repetitive actions of rituals lead to greater self-control and more feelings of “affiliation and empathy”. He implies that the use of rituals originated in religion. 3.) “Religious virtues such as gratitude and kindness.” See below. That’s about it, but one can think of other ideas as well. Whether they come from religion is debatable, and I’ll get to that in a minute. DeSteno’s conclusion? If this view is right, religion can offer tools to bolster secular interventions of many types, such as combating addiction, increasing exercise, saving money and encouraging people to help those in need. This possibility dovetails with a parallel body of research showing that by cultivating traditional religious virtues such as gratitude and kindness, people can also improve their ability to reach personal goals like financial and educational success.
. . . My purpose here isn’t to argue that religion is inherently good or bad. As with most social institutions, its value depends on the intentions of those using it. But even in cases where religion has been used to foment intergroup conflict, to justify invidious social hierarchies or to encourage the maintenance of false beliefs, studying how it manages to leverage the mechanisms of the mind to accomplish those nefarious goals can offer insights about ourselves — insights that could be used to understand and then combat such abuses in the future, whether perpetrated by religious or secular powers. It’s clear that what DeSteno means is that science can find out stuff if they test hypotheses derived from examining religion, but that science itself doesn’t benefit. Science is, after all, a set of practices that help us find out stuff, and it isn’t and has never been helped by religion. It is society that benefits—supposedly. DeSteno calls these testable hypotheses “spiritual technologies”, a word he got from Krista Tippett (it has shady overtones from Scientology, though). But he also says, correctly, that these practices can be separated from religious dogma, and also don’t vindicate the dogma of any religion. In response to Pinker, who, when faced with DeSteno’s ideas, said that these are cultural and not religious practices, DeSteno says that it’s hard to separate the two. And it is, which is one of the problems of DeSteno’s thesis. Are these techniques derived from studying religion and its supposed successes, or do they come from elsewhere? I’m willing to admit that meditation comes from Zen Buddhism, though many people don’t see that as a religion. But that aside, it does seem to have value, though some people, like Dan Dennett, never feel the “mindfulness” and “out of self” experiences touted by adherents like Sam Harris. I would be interested to see if the scientific studies of meditation explicitly credit Buddhism, but I won’t carp if they did. As for “gratitude and kindness,” I deny that these ideas derive from religion. While some religions emphasize them, many urge them on adherents to their faith but urge intolerance and dislike towards members of other faiths. That, indeed, was the situation throughout most of religious history. If you ascribe “gratitude and kindness” to religion, you must also ascribe “dislike, xenophibia, and intolerance of others” to religion as well. Here DeSteno is brandishing a double-edged sword. There are many reasons to think that religion adopted the “gratitude and kindness” stand from secular reason and from evolution. These virtues would have arisen via experience and evolution over the long period of time when humans lived in small groups—groups of people who knew each other and thus could practice these virtues in light of the expected reciprocity from others. And, of course, secular ethics has emphasized these virtues from since forever. As Rebecca Goldstein told me, moral philosophy is a thoroughly secular enterprise. And she’s right. Religions simply took over these virtues from preexisting groups. Threats as a way to control behavior. There’s nothing more compelling than making people behave than by threatening them if they don’t. Religion is excellent at doing this, especially through threats of burning in hell. Other threats have been used by dictatorships to make people conform. What are Nazism and Stalinism but oppressive ideologies that use the methods of religion, including god figures, threats, ritual, and punishment of apostasy and blasphemy? Deprivation of freedom of expression. Religions have been suppressing heresy for centuries, a technique taken over by totalitarian regimes to ensure control. Use of raw power to get your way. Here I’ll mention how some Catholic priests have used the cachet of their church to sexually molest young people. Promises of reward if you give money or effort to the church. People who tithe expect rewards, often in the afterlife. But “prosperity gospel” hucksters like Creflo Dollar, as well as Scientologists, use these promises of reward to bankrupt their acolytes. Now scientists may not have studied these religious methods to judge their efficacy. After all, who would fund a study of whether gaining religious power over someone makes them more likely to succumb to sexual molestation? But the hypotheses that these methods work can reasonably be ascribed to religion (at least as reasonably as the three ideas mentioned above), and they have been used to damage human beings. On balance, one can’t say that the existence of religions has been an overall good in making humans feel good and behave well. Likewise, we can’t say that scientific discoveries about human behavior would be less advanced if religion hadn’t existed. Hundreds of scientists from all over the world have applied to attend the first three workshops, and a dozen have been selected to participate in each one. According to DeSteno, several of their workshop attendees have written articles for major news outlets such as theTimes, The Wall Street Journal, and Scientific American. Now they are planning a fourth workshop this fall in Boston. Scholars yearn to provide insights into some of the big questions. Yet, too often, they are limited in their abilities to communicate findings directly to a knowledge hungry public .The result is either that scholars write mainly for one another, placing important knowledge in insular academic journals that are beyond the reach and interest of the public, or rely on intermediaries to digest and transmit knowledge. If science and philosophy are to maximally enhance well-being and benefit humanity, scholars must have a way to more easily disseminate their discoveries to the public. Success in doing so requires learning not only how to tell a good story, and how to write in different styles, but also how to approach, pitch and work with editors at prominent publications. There’s the Big Questions trope again, which is TempletonSpeak for “osculating faith.” I see workshops like this as Templeton fostering a way to spread its own views to the public, as DeSteno does here (this article could have been written by a Templeton flack). And two of DeSteno’s new Templeton grants are for further workshops in this kind of communication. There’s a lot of dough to be made, and public approbation to be gained, by claiming that science and religion have a lot to teach each other. Yes, science can often test religious claims (Adam and Eve, the efficacy of prayer, and so on), and these claims are always dispelled. As for religion’s contribution to science, as outlined by DeSteno in this article, well, it’s not impressive. It’s not to the New York Times’s credit that they continue publishing religion-osculating pieces like this. Would that they gave the same space to criticisms of religion! 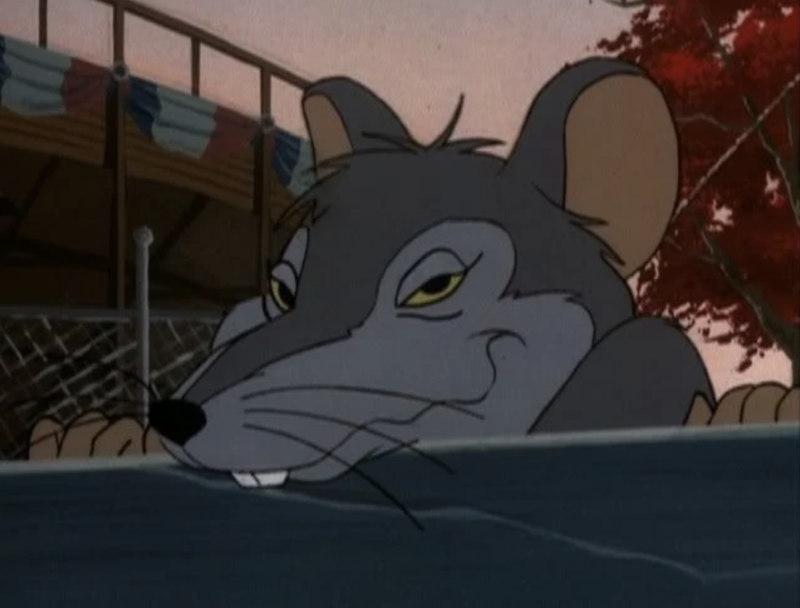 This entry was written by whyevolutionistrue and posted on February 3, 2019 at 10:00 am and filed under Accommodationism, science bashing, Templeton, Templeton at it again, Templeton's shenanigans. Bookmark the permalink. Follow any comments here with the RSS feed for this post. Both comments and trackbacks are currently closed. Let’s assume(!) that science can learn from religion – how likely is it that religion can learn from science? They have, at least some of them. Now Catholic theologians are arguing how to reconcile the non-existence of Adam and Eve as our literal ancestors with the Bible story and Christian original sin. Also, many liberal faiths have had to accept the existence of biological evolution. I think that 2,000 years of “experimenting” in this world-sized Petri dish has been an ample test of the hypothesis that religion is useful for gaining scientific knowledge. It is more than clear, I think, that religion motivates people to move in the direction of ignorance more than it causes people to seek discovery. Despite your decision not to I wish you’d send this to The Times. A lot more people than read this blog need to see this, Particularly the editors of The Times. The Times wouldn’t publish anything already put up on a website, and it’s not written in their style anyway. Some day I’ll try writing an op-ed for them. . . I don’t know what to make of the Templeton Foundation – they seem to support everything from Intelligent Design to the vaguest notions of “spiritual but not religious” – groups who are traditionally very much opposed to each other. And they spend tremendous amounts of money doing this. Their aims seem so diffuse and sometimes mutually incompatible that it’s hard to know what to think. I have no problem with the idea of studying meditation (as in the work of Richard Davidson,) but don’t know if this is a particularly controversial topic anyways. There has been a veritable explosion of studies and meditation and related matters in the past decades, it’s not as if some taboo is blocking the way. The Templeton Foundation is obliged to follow loosely the wishes of the dead American-born, naturalised Brit-Bahamian, Christian Presbyterian, conservative, stock-picking genius Sir John Templeton. An interesting chap – he eschewed the trappings of the extremely wealthy although he indulged himself with a lovely home & permanent residence in Nassau, Bahamas. I believe the problem with his foundation is the people working inside [on very, very nice salaries!] are not imaginative enough & they’re throwing money mainly at a lot of nonsense – a number of academics have figured out how to play the Templeton game & it’s beginning to show. They know exactly how to word their grant applications & the golden handcuffed staff just give ’em the money because they have more dosh than they know what to do with. The amount of money released in grants each year is a lot less than the profits on the principle sum**. Perhaps there are limits on the size of an individual grant, but the mechanics of the foundation are private. The sciences need to start filling in those applications & I believe some of the more exotic fields have done so. I thought I remembered Dennett talking about TM (Fun fact – I recently saw that Hugh Jackman is also a big fan. Since I see approximately one movie every decade or so and this go-round it was The Greatest Showman, which I loved, I was incredibly pleased to see he is a meditator. Not only that, but in his interview with the David Lynch Foundation, he talks about reading one of Sam Harris’s books – who knew?!) I think TM is based somewhat more on Hindu philosophy while mindfulness has more of a Buddhist framing, although, given that there are only so many ways to focus attention / be accepting, I think all the various types are fairly similar, albeit with different emphasis. It’s hard to find much in the way of information regarding TM, as I gather it’s trademarked or something. For rituals, is chanoyu (茶の湯), the Japanese tea ceremony, religious? And I completely agree about kindness and gratitude. Claiming these for religion alone is egregiously disingenuous … but sadly commonplace. The Stoic treatment of emotions is the complete antithesis of that of Buddhism, through its teachings of mindfulness meditation. Vulcans are excellent Stoics in this way, and totally unregenerate Buddhists. Is it not still meditation? Not really, at least the meditation that DeSteno is talking about and the scientific community is investigating. It’s a very specific technique and has been secularized and hybridized with cognitive therapy. The very fact that it’s showing promising results outside of the woo of Buddhism speaks to its inherently secular and practical roots. And how does that contrast with Stoic meditation? Look into some of the review papers on current meditation research. There are reams of them nowadays. In a sentence, Stoic “meditation” is not a method. I haven’t looked at this topic specifically, but I have seen a lot of stuff from “neostoics”, which, while interesting sometimes, was *not* attributed to Stoics correctly (if at all). One example is a “stoic a day” calendar/book I got. Several times (examples later if people want) the exegesis was crucially wrong. One thing that is often downplayed is the teleology. Stoics think the universe and humans have divine purpose; something that many on this site would vociferously deny, I’m sure. If I heard my radio ask someone how they “inhabit the space of their theories”, I would defininitely yell at it. I hope I would have the confidence to answer “Since my theories are true, the space of my theories is the world, and I have no trouble inhabiting it”. Meditation has been a cultural, religious, philosophical and self-help practice that probably originated in India long before the Buddha, who adapted it for his purposes during his lifetime. I think Vipassana (mindfulness) meditation is uniquely Buddhist but this agnostic religion cannot claim to own this practice. I would even say that there would be no religion called Buddhism without mindfulness meditation first. Dr. DeSteno, with his ample Templeton funding, has obviously learned a lot from religion. He learned, like the professional Pardoner in Chaucer’s tale, that broadcasting the Church’s woo to the rubes is a good way to “have multipliyng of his greyn”. However, the history of Science implies that, at an early stage, something may have been learned from Christianity. Why did experimental Science develop in Western Europe and not in Baghdad, Cordoba or China? Nobody knows, and I personally lean toward the quality of Italian wine as a favorite, plausible explanation. But something about Christian doctrine, or about the way it was promulgated in the times between Friar Roger Bacon and the Accademia dei Lincei in the early 1600s, might possibly be involved. I’m particularly offended by the hoary notion that practicing some religious or spiritual activity makes a person better in a moral sense, in that it assumes that a person is morally deficient if they don’t believe in something supernatural and follow some spiritual/religious tenets. My question to DeSteno: “Why are there so many corrupt people of faith and so many good, fair-minded, moral, non-believers? As for the first of these “religious ideas,” meditation: Buddhist (or any other kind of) meditation doesn’t necessarily make someone a better person. I find a lot of blissed-out self-satisfied meditating narcissists. I think of all those meditating Burmese Buddhists, including Aung San Suu Kyi.” Where’s the Buddhist compassion? And Alice Walker (a spiritual exhibitionist) is convinced that her Buddhist meditation and other spiritual practices make her the wise, compassionate holier-than-thou one full of wisdom that she thinks she is. Ha. Ritual: I would argue for the cultural as opposed to religious origin of ritual behavior. Non-human animals engage in ritual behavior. Some would regard it as ‘proto-religious,’ I say that’s begging the question. But I think that all of DeSteno’s arguments beg the question. That’s what religious arguments do. And I guess I’m begging the question by asserting that. “Religious virtues, such as gratitude and kindness,” are also not specific to humans, as the numerous videos posted on this site of intra- and inter-species altruistic behavior in animals, gratitude, kindness, self-self sacrifice. It’s hardly a novel observation that religion/spirituality can make people callous and cruel as easily as it can make them compassionate and grateful. I can second that. I was religious and a jerk, now I’m not religious anymore, and I think I’m slightly less of a jerk (I’d hope). Point is: how many of those that lost their faith, or converted to it, are more ethical, less of a jerk now? Does conversion either way make for a better person? DeSteno’a thesis here seems to be that science and religion can and should collaborate on mass mind control tactics. He also defends religion by telling us it isn’t always wrong; the “stopped clock” defense. TM could be called “Benson Meditation” (leads to an unfortunate acronym, tho’) if we learn it from his book The Relaxation Response (1970s, but much updated and still in print). He had one terminal PT, Spanish & RC, who reduced suffering by using a 4-word Xian prayer “mantra”. But remember that awful Teapot Tempest in CA a few years ago, when a bunch of Xian bigots stopped a school from teaching Benson’s method of meditation. For me, “Let’s Spend the Night Together” seems like a nice mantra, too. Meditation is a good mental exercise. Like tennis or music, it’s better if you practice daily. Sorry, maybe off topic but. Loot at that graph, anyone else note where Israel is on the Religious scale? Israel is a lot less religious than most people think. There are a lot of secular Jews, and they tend to be nonbelievers. for how long? — given the godbots’ reproductive imperative..
Can science learn from pseudoscience? By looking at groups which deny the worth of vaccinations, practice ESP, promote “healing energy,” advocate astrology, and believe that the earth is flat and the moon landings were faked, are there interesting facts to be found regarding how we think, how we value some virtues over others, and what makes people come together and stick together against the disapproval of society in order to strike out in new directions — or return to the old? Does the study of pseudocientists and their adherents tell us some important things about the way the human animal ticks? And might the very nature of pseudoscience lead to self confidence and love of the planet and the people on it? Does pseudoscience enchant the world? Why yes, I think it can and does, for all those questions. And I’ve read interesting books by scientists and psychologists, professional and amateur, which carefully examined how and why pseudoscience not only interests people, but can help them with what they emotionally need. But so what? This is hardly a recognition of the unique *value* of pseudoscience per se. Scientists and others aren’t wrong to scorn it, or criticize it, or try to eliminate it through teaching and other methods. Once again, by tripping lightly over both the dangerous methods and flawed conclusions and focusing on the “ benefits,” someone else reconciles science and religion in a damned shallow sort of way, one similar to reconciling science with pseudoscience. You’ve said exactly what I wanted to say. DeSteno’s article suggests to me that we should study religion as a natural phenomenon rather than reconcile it with science. Not only that, we *must* if we want to help move away from it. Yes — or parked themselves on top of those qualities and claimed them as their own. Parasites, dogs in mangers! Yes, history is worth studying. Social sciences may well find fodder for analysis in religious culture, among other things. This says nothing about the role of religion in society today. It is like studying folk medicine to see if there are any useful nuggets buried in it, without suggesting that we adopt it wholesale. That graph is telling, but it also tells us there is more than a lack of religiosity to explain happiness. The plot is really very widely scattered with several very far outliers. Bulgaria appears to be very unhappy, while being quite non religious (Maya, comments on that? ), same, but to a lesser degree, China, Hungary and Ukraine. I note that all of them are former communist countries. On the other hand we see some countries that are reasonably happy while being quite religious: Brazil, Kuwait, the US and Mexico. 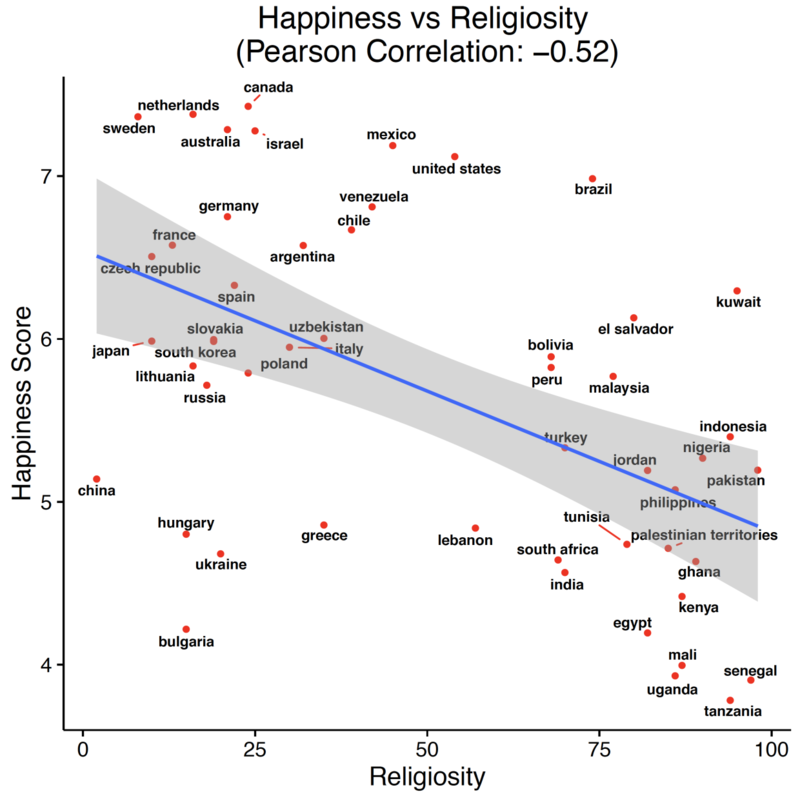 Now I do think that the inverse correlation between religiosity and happiness is real, but the graph really shouts: what other factors? There are more than 150 countries in this world, the graph only shows about a third. It’s power would be greatly enhanced if some 100 more countries would be included. Sadly, that graph gives all the countries in the World Happiness Survey that have also been uniformly surveyed for religiosity. But I’d bet that the correlation would get stronger if you included more religious areas like sub-Saharan Africa and the Middle East. Yes, I would think so too, that the correlation would get stronger there clearly is a trend after all. – Ritual? Well yes, even scientists sometimes fall into a ‘ritual’, preparing and carrying out the experiment correctly, but they don’t need religion for that. Ritual, useful and psychologically satisfying as may be does not inform science. Gratitude and kindness? What has a quark to do with that, or the Krebs cycle? We would all be grateful if you would have the kindness not to spout the nonsense that science can learn anything from religion. Yes. That is how it should be seen, I’d think. Did I read that graph correctly? People in Venezuela are slightly happier than those in Germany? What year does the data come from? What method did he use to determine the amount of religiosity was in each country? And how did he determine how happy the people in each country were? That chart has what appears to me to be some odd groupings and placements. Yes, I agree. Countries like Hungary, Russia, Bulgaria, and Poland definitely have to move to the right of the chart, just like many Middle Eastern countries did over the last 50 years. Thank you for the link. I was surprised st some of the countries that showed up as very religious. Very information. I note that that post shows quite a few more countries. What I find kinda shocking (well not really unexpected) is how heavy the right hand side (‘religion important’) is. Maybe we’re on a right track in ‘western’ countries, and a few -mostly formerly communist ones- in the rest of the world, but it appears that atheism (or religion unimportant to be more precise) is a predominantly ‘Western’ development. Does anyone think that modern culture could benefit from some RITUAL and maybe a little Creed that was NOT religious or nationalistic?? Like atheists could try to reclaim Christmas into its Solstice origins: feasting, lights, Yule log. And spring, lovely for its Rejuvenation, we could drink a lot of wine and dancing around a May Pole. Naked?! Maybe also some healthier death rituals about us being recycled back into Nature’s ongoing Recurances? I’m ready to apply for the High Priest position but I’d need good High Priestess! Do you think Gwenith Paltrow is available? The Creed would be based on science backed info on the interconnection of living things, The Lifeboat Earth Idea , and the Organism-like character of The Ecosphere and human society. Start your own new age thing & you can have as many Gwyneth ‘high priestesses’ as you like. Just rip off Pierre Teilhard de Chardin’s ideas – his science/spirituality mash up, the “noosphere” & the Omega Point, evolutionary unification of consciousness. His “bad poetic science” [Dawkins quote] would fit you snugly – just peel away the Jesus veneer & you have your suit of clothes ready to wear. Michael, you’ve got no emotional attachment to Nature and its creatures? Surely you have been awed by it often. And as serious a commentator as Lewis Thomas called the Earth a “loosely fit spherical organism.” We could benefit from some well-directed emotional attachment to a thing larger than ourselves and not a god or a nation. Maybe. Don’t talk about me that’s irrelevant to my comment. It seems you didn’t check out Pierre Teilhard de Chardin – your ideas & his ideas overlap quite a bit [I read your blog]. sorry, didn’t realize it sent. The Super Bowl doesn’t count I suppose? It has a bit of nationalism and I’m sure they worked some God in there too, at least in the commercials. It is certainly a ritual. Thanks for the comment, and thanks for reading. I’ve heard of de Chardin but never read him. I have read some other idealists like A.N.Whitehead. Super Bowl counts but we could do better. The Olympics is better; big dose of ritual and a much better theme: “Let’s peacefully and fairly compete” (kinda) and it is a World Wide Focus. If our world is ever going to get along better, we need more mutualist focal points. I think the culture war over Xmas is important to our nation. If it could be reclaimed from the Christians and returned to its other origins it could be a more inclusive focal point for Americans. If we could turn the focus toward Nature –knowledge of the seasons, sense of their impact on us — Ya, a little more social solidarity wouldn’t hurt. Well, this ‘someone’ emphatically does! And the U.S.A. is a nation that might benefit the most. Consider the ‘National Cathedral’ in D.C. That place, though ostensibly a part of the Episcopal Church, is run as if it were the equivalent of St. Paul’s or Westminster in England. and our votes the benediction we confer. “What science can learn from soccer”? The film, with cheering soccer fans, reminded me of events when I was student teaching in a high school. The so called pep rally was a noisy, boisterous, cacophony. Students stomping and chanting in the auditorium while cheer leaders tumbled and ran around with banners. The noise was deafening. But, I got the feeling that is was a release, a catharsis for the students who are expected to sit at desks all day. War is like that too. This article would be a lot more impressive if the significance study had used all countries and not a handpicked 1/3. I agree with the theme of the article though. Morality in a society gives an individual a sense of safety. The belief that everyone in a society has the same morals is the glue that holds democracies together. Morality is crucial to happiness but religion and the inevitable extremism that comes from it are not necessary. One can have a set of believes about what is “right” or “wrong” without also having the fear of punishment from a supernatural force. It’s not a “handpicked 1/3”: these are all the countries for which we have both happiness and religiosity data. And that was data from a previous article that explained its source. The data were added later to an article that stands by itself. It ticks me off when people like you imply that the data were chosen to make a specific point. They weren’t. Why didn’t you ask before you made your incorrect pronouncement? Thanks for your pronouncement, and see you on other websites. Ben, I agree with Jerry here. This is about all we’ve got (as good as it gets at present) and there is not the slightest suspicion there was hand-picking involved. I lamented the same lack of ‘other countries’, but that does not in the least imply cherry-picking.